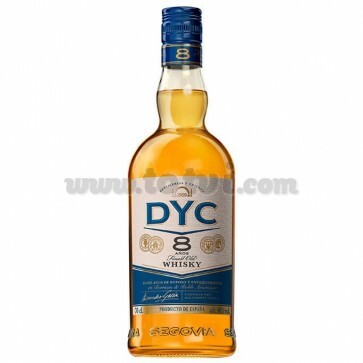 DYC 8 Years is a Spanish blended whiskey with a spicy aroma and slight touches of vanilla. Long in the mouth and with a soft finish. DYC 8 years is a Spanish Blended whiskey with a spicy aroma and slight touches of vanilla. Golden amber color. On the nose floral touches, spices, smoked, fresh grass, touches of honey and heather while in the mouth is a soft and creamy whiskey, peat with hints of vanilla, marzipan, apple and citrus. Long in the mouth and soft finish. 8 years aged in American oak barrels of each one of its spirits have endowed this aged blended with an incomparable intensity and flavor.